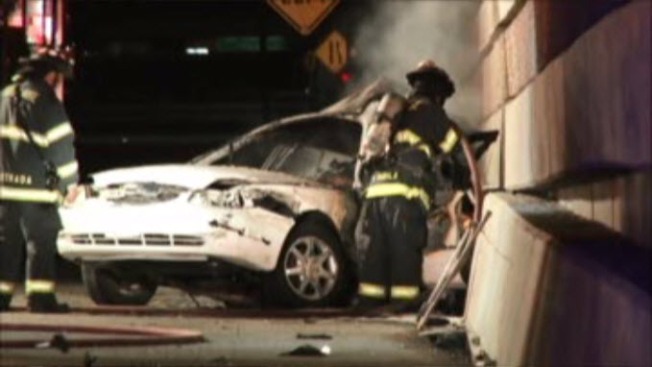 All lanes of northbound U.S. Highway 101 at De La Cruz Boulevard in San Jose were closed for about three hours Tuesday morning after a multi-vehicle crash killed at least one person whose vehicle was on fire after a crash, according to the California Highway Patrol. The first call of the crash came in at 12:22 a.m., CHP Officer Matt Rasmussen said. When officers arrived, they found an In-N-Out pickup truck and another vehicle involved in the accident. The driver of one of the vehicles was trapped inside his burning vehicle, the CHP said, and he was later pronounced dead. The driver of the In-N-Out pickkup truck was not injured. The CHP said that it seems like one of the vehicles was stopped in the lanes and the second vehicle hit it. Northbound 101 opened at 3 a.m.